In the words of the old Chinese curse, we live in interesting times. Never before in Jewish history have so many people been engaged in Torah study across the globe. Never before in Jewish history have so many Jewish schools operated. Yet at the same time, despite all of this Jewish learning taking place, there are legions of Jews who are abysmally ignorant of their heritage, and myriads of children who receive no Jewish education at all or only a smattering barely sufficient for the bar/bat mitzvah rite de passage. The positive results can be seen in the numbers and the quality of highly educated men and women who are not professional rabbis or educators and who continue their studies lishma. Often this cadre has spent a year or two of post-high school intensive study in Israel. All over the world there are ongoing shiurim at all hours, chavruta study, Daf Yomi classes, lectures, batei midrash for retirees, etc. The level of discourse in Torah by baalei batim who are businessmen, electricians, lawyers, physicians, retirees, housewives, pharmacists, tradesmen, professionals, etc., is quite elevated. At the same time, the abysmal ignorance displayed by the masses of Jews today is deplorable and directly responsible for the plague of assimilation and intermarriage. For centuries, until the Emancipation and Enlightenment periods, Jews did not have entry into general society. Until the ghetto walls came down, Jews lived in an insular society. As such, Jewish literacy was fairly high. At a time when most of the world was still illiterate, Jews read and studied and mastered large amounts of their religio-literary heritage. Children read Hebrew, adults studied when their work was done, and shuls had a chevra Tehillim, a chevra Mishnayot and a chevra Shas. Those with ability and scholarly potential were sent to higher yeshivot to continue their studies. Bear in mind that before the era of electricity people worked from sunrise until sunset. Evening activities were limited, usually to the tavern or to the beit midrash. There were multiple reactions to the modern era. Some Jews totally assimilated and were lost to Judaism. Others preserved their Judaism by becoming insular and isolated. Other groups tried to meld traditional Judaism with modernity. Still others created new modern versions of Judaism more in keeping with the times. Another group expressed their Judaism through a desire to return to Zion. Still others focused on Yiddish or Hebrew language and literature. Then you have the cultural Jews. Those who expressed their Judaism via Jewish foods (gastronomic Jews) or through a sense of “feeling Jewish” (cardiac Jews), or through charitable organizations (civil Judaism). These are all important components of contemporary Judaism, but the key ingredient to a Jewish future is not just “doing Jewish” but “knowing Jewish.” Study of our foundational texts gives us the means to understand Jewish values beyond some abstract touchy-feely sense of Jewishness. The average Jew today cannot read Hebrew, has no knowledge of the Bible beyond some pediatric stories, and certainly has had no serious contact with the study of Jewish history, Talmud and rabbinic literature. Without this base, what do most contemporary Jews have to pass on as their heritage? The various Jewish communal structures need to understand this and make it part of their mission. At one time Israelis at least knew Tanach and Jewish history. Those generations have come and gone. When they come here, since religion plays a very minor role in their lives, their children often can no longer even read and write Hebrew! FSU emigres were denied access to anything Jewish for seven decades. Aside from efforts by Chabad, the community has also been unable to penetrate this group to educate them and their children. What passes for Judaism today in many circles is truly shocking. The observation has been made that as deep as one can go in Torah, so too is the depth of ignorance. Many Jewish communal functions begin the meal with the ritual Hamotzi. I once observed this blessing being made over a latke at a Chanukah luncheon. I was invited to attend a “shiva” on a Tuesday evening. I met someone recently who complained that he couldn’t get horseradish with his calamari. I had to attend a dinner for a well-known Israeli philanthropy that started before Shabbat was over and wasn’t kosher. (A local kosher restaurant matched the meal and even the plates, wrapped, of course, in multiple layers of foil and cellophane.) Then there are those for whom naming a child after a deceased grandparent is the most important mitzvah, or coming to shul to say a transliterated Kaddish without even a tallit or tefillin. 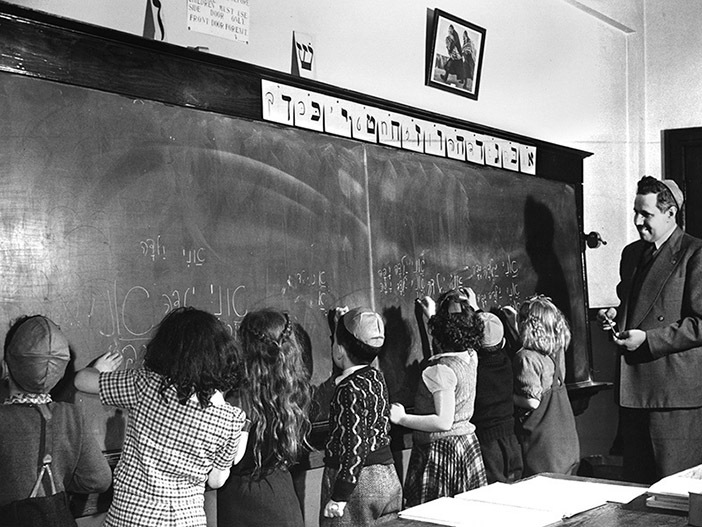 We’ve come a long way, but we cannot afford to ignore the destructive force of Jewish illiteracy. We ought not to cavalierly and triumphantly dismiss the plight of our less-committed co-religionists. In Part II we shall try to suggest some approaches to this issue. At best this post was written for the “choir” of “preaching to the choir” fame, i.e., the already convinced minority. The article gives no compelling reason for being/becoming Jewishly literate in the first place. Without this foundation, there is nothing in this post that would resonate with the vast majority of North American Jews. With a vote of their feet, they have decisively declared, Judaism and its delivery systems are meaningless and irrelevant save for an occasional life cycle event, or perhaps a High Holiday worship service. Most North American non Orthodox (NAnO) Jews today are Jews without Judaism, Jews in name only (JINOs) and are Jewish like a Reuben sandwich is Jewish. Please checkout the video below for a d’rash on all this that pulls no punches. The Reuben video doesn’t answer your question either. “Why be Jewish” is an assumed axiom which cannot be answered to everyone’s satisfaction. Certainly not in a brief posting. As far as preaching to the choir, you are correct, since it is the “organized” Jewish community that needs to address this issue or we will lose large numbers of Jews over time. Pt 2 coming early next week. the primary undertaking of North American non Orthodox (NAnO) professional Jews (clergy, educators, movement staff, etc.). They are: “Why be intentionally Jewish? Why do Jewish? Why Judaism?” Orthodox Jews have no problem answering these questions. NAnO Jews and their leaders haven’t and until they do in a clear and compelling way, all else in the realm of strategy is a cart before the horse exercise in futility. My question to you with which I began my initial response remains unanswered. Here it is again: “What’s the payoff to individual Jews for being Jewishly literate?” Or put another way, “why should Jews choose to be Jewishly literate?” I hope that part 2 of your presentation deals with this.